With the rapid changes in the fashion industry, it is at times difficult to keep up-to-date on all the things you need to have in your wardrobe particularly if your schedule is a busy one. Therefore, we have decided that each week we will keep you well informed on the latest fashion trends. From shoes to skin-care products we will select all your ‘must-have pieces’. To get us underway, this week we have selected some striking fall trends straight from the pre-fall collections themselves. The Fringe is making a significant reappearance in terms of trend with many designers adding the bohemian touch to their resort collections. 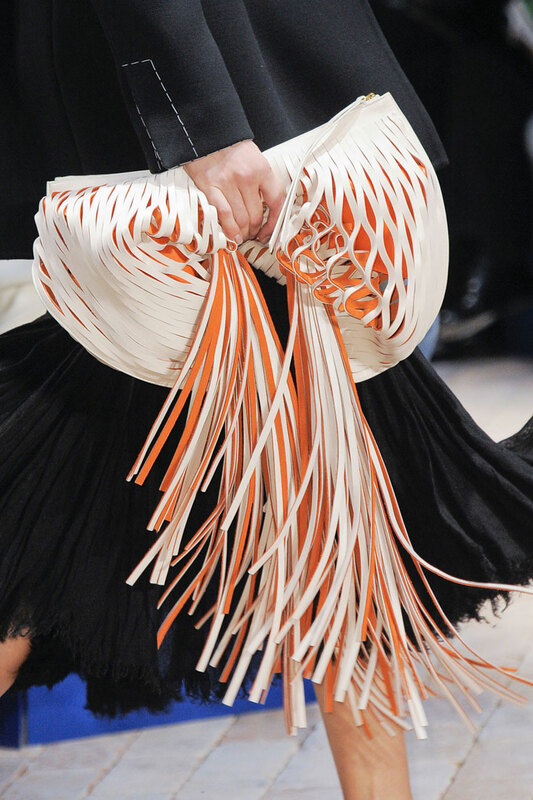 Rather than diving head first into this trend, as it is quit a bold look; we suggest the fringe handbag or clutch to spark your love affair with the impending trend. Our selection of the fringe bag collection begins with a luscious red Valentino fringe clutch to add a hint of vibrancy to your LBD, to continue the colour rainbow a blue and yellow RAF clutch with fringes. For our final choice of fringe bag we selected a simple easy to wear black Volcom fringe clutch for every occasion. The pre-fall collections from Markus Lupfer have definitely set a forecast for gorgeous Jacquard prints on skirts. Whether it’s minimal like Alexander Lewis or just outright loud, a short skirt in this style is the perfect winter look. Especially when combined with the pointed loafers (as seen above) or with your favourite winter boot, creating a timeless piece that will easily fit into your wardrobe. When it comes to Jacquard skirts it’s best to look for luxury prints that reference high fashion or 19th century european art textiles. Therefore, our first best pick for the Jacquard short skirt is Roberto Cavalli with his captivating silver piece that is sure to show off your legs in an illustrious fashion. Following the Cavalli skirt we selected a glistening gold leaf Ostwald Helgason skirt and finally for a more modern twist we selected the Oasis Geo-print skirt. To keep up to date on our favourite garments and emerging designers follow us on our social media.